Since the discovery of the first kinesin spindle protein (KSP, also known as Eg5, KIF11) inhibitor, monastrol, in 1999 (1), there have been a plethora of articles, 3D structures, and FDA applications based on the same binding site (review ). The binding site is called the allosteric monastrol binding site (AMBS) which functionally plays a significant role in transducing chemical energy to movement of the neck-linker region. 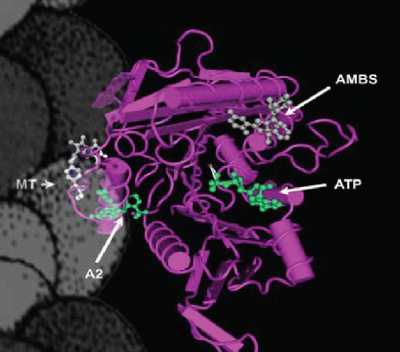 Drugs that bind this site are non-competitive inhibitors of ATP and microtubule (MT) binding. To date, the majority of published drugs bind to this site which is coincidental in most cases; the reason for this is not apparent but possibly because the site is one of the most dynamic sub-domains of kinesin (3). More recently, interest has focused on other drugable sites in part because the AMBS compounds are known to select for resistance mutations (4,5). Alternate sites could be ATP or MT binding competitors or other allosteric pockets. These alternatives are represented by Fig. 1, which shows their general location with respect to the MT and coiled-coil tail which binds adjacent KSP molecules in a tetramer design (6). Excellent biochemical work by multiple groups has enabled classification of new binding sites (7-10); their method of classification sets a necessary standard for characterization of future KSP inhibitors (see below). Figure 1: Kinesin’s drug binding sites. Figure 1. Drugable sites within KSP motor domain. The magenta color represents KSP’s polypeptide structure in a worm/tube scheme, and the MT is in ghostly grey. Drugs representing the four different known sites in KSP: a) AMBS represented by MK-0731 (12); b) ATP site represented by ADP (13); c) MT site represented by NSC 622124 (10); and d) a second allosteric site (A2) binding near to the MT and ATP sites represented by GSK-1 (9). imply using only 100 µg per patient. Thus, very high affinity drugs might not be the way forward; instead it may be better to use low micromolar Kd compounds and administer 20-100 mg per dose. In this case, serum binding and elimination mechanisms would be saturated while the target is effectively inhibited. Figure 2: Two drugs in the AMBS site. Figure 2. Monastrol and MK-0731 in the AMBS have very different affinities, low and very high, respectively. Monastrol is in panel A (14) and MK-0731 in panel B (12). Note the more complex aromatic structure of the high affinity compound. One key aspect to KSP’s drug family future is to develop standard characterization schemes that substantially characterize each compound pre-clinically. These aspects include 1. biochemical: competition with ATP, MTs, and monastrol to determine site of action; 2. cell biological: classification of cell phenotype; 3. cell line resistant mutations and sequence analysis; 4. drug cross-linking and peptide analysis; and 5. 3D protein model representation of the binding site. Two excellent examples of such studies are GSK-1 by Luo et al. (9) and NSC 622124 by Learman et al. (10). At Cytoskeleton we are developing a Pre-Clinical Pharmacological Profile (PCPP) for kinesins (and myosins) which provides a report that characterizes new compounds with these guidelines and provides a reference for documentation purposes (for more information, contact tservice@cytoskeleton.com). In conclusion, targeting KSP is following the historical drug development trajectory of other important classes of clinical compounds such as GPCR inhibitors and microtubule inhibitors, both of which took 20+ years to reveal their potential. Mayer T.U. et al. 1999. Small molecule inhibitor of mitotic spindle bipolarity identified in a phenotype-based screen. Science. 286, 971-974. El-Nasaan H.B. 2013. Advances in the discovery of kinesin spindle protein (Eg5) inhibitors as tumor agents. Eur. J. Med. Chem. 62, 614-631. Cytoskeleton’s September newsletter “Probing sub-domains of kinesin”. Brier S. et al. 2005. Molecular dissection of the inhibitor binding pocket of mitotic kinesin Eg5 reveals mutants that confer resistance to antimitotic agents. J. Mol. Biol. 360, 360-376. Tcherniuk S. et al. 2010. Mutations in the human kinesin Eg5 that confer resistance to monastrol and S-trityl-L-cysteine in tumor derived cell lines. Biochem. Pharmacol. 79, 864-872. Kashina A.S. et al. 1996. A bipolar kinesin. Nature. 379, 270-272. Groen A.C. et al. 2008. A novel small-molecule inhibitor reveals a possible role of kinesin-5 in anastral spindle-pole assembly. J. Cell Sci. 121, 2293-2300. Ulaganathan V. et al. 2013. Structural insights into a unique inhibitor binding pocket in kinesin spindle protein. J. Am. Chem. Soc. 135, 2263-2272. Luo L. et al. 2007. ATP-competitive inhibitors of the mitotic kinesin KSP that function via an allosteric mechanism. Nat. Chem. Biol. 3, 722-726. Learman SS. et al. 2009. NSC 622124 inhibits human Eg5 and other kinesins via interaction with the conserved microtubule-binding site. Biochemistry. 48, 1754-1762. Song H. et al. 2013. Kinesin spindle protein (KSP) inhibitors in combination with chemotherapeutic agents for cancer therapy. Chem. Med. Chem. 8, 1736-49. Cox C.D. et al. 2008. Kinesin spindle protein (Ksp) inhibitors. 9. discovery of (2s)-4-(2,5-difluorophenyl)-n-[(3r,4s)-3-fluoro-1-methylpiperidin-4-yl]-2-(Hydroxymethyl)-n-methyl-2-phenyl-2,5-dihydro-1h-pyrrole-1-carboxamide (MK-0731) for the treatment of taxane-refractory cancer. J. Med. Chem. 51, 4239-4252. Turner J. et al. 2001. Crystal structure of the mitotic spindle kinesin eg5 reveals a novel conformation of the neck-linker. J. Biol. Chem. 276, 25496-25502. Maliga Z. and Mitchison T. 2004. Structural basis of eg5 inhibition by monastrol. Pubmed (Pubmed entry only, no published citation), MMDB ID: 35963, PDB ID: 1X88. Rashid U. et al. 2013. Structure based virtual screening-driven identification of monastrol as a potent urease inhibitor. J. Mol. Graph. Model. 43, 47-57.